Many permanent residents noisy and rude. Manager didn't care when pointed out to them. Our 29 foot trailer could only fit in one site as we are required to also put the truck in the short spaces left over from permanent residents. Sites extremely close together. Will not stay there again. Wi-fi did not work most of the time. We camped at Virginia City RV Park in a Travel Trailer. Park has 50 sites, but over 20 of them have full-time residents in them. The management is rude and uncooperative. When we booked, we asked to be put together, but they would not allow it. We had to trade among other campers who has the same problem. The sites were very small, with many of them barely wide enough to allow a slide out, let alone park your tow vehicle. The upkeep was poor, so much so that my wife and daughter were locked in the bathroom due to a malfunctioning deadbolt.If you want cable TV, make sure you bring your own splitter or adapter, as the cable comes out of a box about 2 feet and terminates with a male end. The town is nice to visit, and there are lots of OHV trails, many right from the campground. The town market is in the campground store, which is good or bad depending on your needs. The problem with this park, is that it is the only game in town and they know it! They seem to be making improvements, but they have a ways to go. 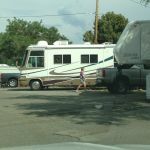 We camped at Virginia City RV Park in a Fifth Wheel.